Purchasing a car seat is one of the biggest decisions for parents. There are so many considerations such as safety ratings, ease of install, style, and weight/height restrictions. Another consideration is the weight of the seat, which comes into question as you lug it around with your little one inside. Car seats can weigh up to 16 pounds! Add in a baby, and you’re looking at 20-30 pounds, that’s an arm work out! Even when your child switches to a convertible car seat, there is often switching between vehicles, handing to another family to carpool or even flying with the seat for getaways. Having a lightweight convertible seat is just as important as the install and safety. All of the car seats included in this post are some of the safest on the market; they cover a wide variety of brands and most are FAA approved for use on an airplane, making them perfect for travel. Looking for the lightest car seat? 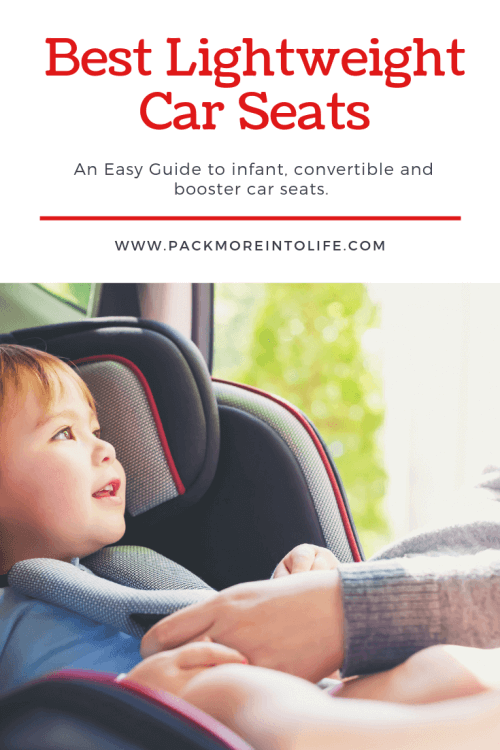 This section will cover the best car seat recommendations for a lightweight car seat for travel and everyday use in each of the three categories, infant car seat, convertible car seat, and booster. The following three car seats are all top rated car seats and the top car seats in their category. The infant and convertible seat are FAA approved for use on an airplane. Boosters are NOT permitted during airplane travel. If you are looking for a portable car seat that is easy to carry around, but also the best rated car seat, then see the recommendations below. 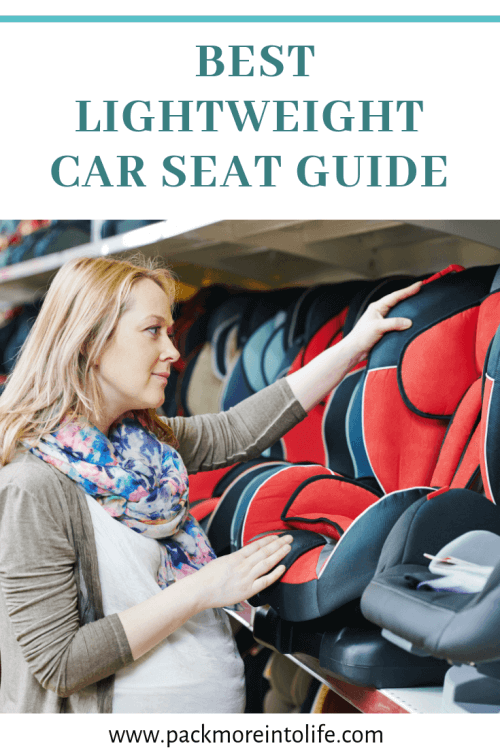 The car seat comparison chart will show car seat ratings, as well as child car seat reviews to help you make the best choice for a lightweight car seat for your family. Lightweight: At only 8.2 pounds (without the base), this is one of the lightest infant car seats on the market. “Clicks” Into Place: The name says it all, you’ll hear an audible click when it is secured in either the base or a compatible stroller. The new base is also easy to install with a swing arm clamp down design. Comfort: There is plenty of cushioning for an enjoyable ride for baby. It also comes with an infant insert for neck and head support. With six reclining positions, you can ensure the comfort of your child and proper install of your car seat. Fits 4-35 pounds: With a low starting weight, it is great for smaller newborns and preemies. The seat goes up to 35 pounds, which is a generous weight allowance and most children outgrow the height restriction first. Portable: As an infant car seat, you can remove the seat from a base or detach from a car seat belt to carry the child. This seat is also an FAA approved travel baby seat that can be used on airplanes. Meets or Exceeds Safety Standards: The Graco Snugride SnugLock 35 Infant Car Seat meets or exceeds all safety standards. New SafetyCore crash force absorption zone on the base. Lightweight: Weighing an impressive 6.8 pounds, it is easy to see why this is one of the most popular travel car seats on the market. Fit “3”: You can fit three of these car seats in the back of most vehicles since the seat measures a slim 17″ wide. Perfect for larger families or groups. Comfort: This seat isn’t well known for its features and comfort, but the seat pad is machine washable and dryer safe. You can also add items such as harness covers. Fits 5-40 pounds: The Cosco Scenera Next seat can be installed rear facing or forward facing. It is meant to grow with your child from newborn up until around age 3. With its five point harness and multiple ways to install, it makes for a great travel seat. Travel: This seat is FAA approved to be used on airplanes. With its slim design at only 17″ wide, it will easily fit in standard airplane seats (which vary from 16″-18″ wide). Meets or Exceeds Safety Standards: The Cosco Scenera Next convertible Car Seat meets or exceeds all safety standards. Lightweight: Since it is a travel vest, which adjusts the seat belt to the proper positioning, this “car seat” weighs 2.3 pounds. Pack-able: The Ride Safer Travel Vest can be easily packed into your carry-on or checked baggage. A storage bag is included with purchase. We love using the vest when carpooling, traveling and quick trips with family members. Comfort: The vest has multiple adjustment points to maximize comfort. There is ample padding where needed. My son does say the shoulder straps bother him if they ride up, but you can easily slide them back down. Fits 3-6 year olds: The size small travel vest is meant for children that are between the ages of 3-6 years old and weigh between 30-60 pounds. Children should be 30-50″ tall. There is also a size large, for children 5-10 years old, weighing 50-80 pounds and 45-57″ tall. Meets or Exceeds Safety Standards: The Ride Safer Travel Vest meets or EXCEEDS all Federal Motor Vehicle Safety Standards (FMVSS 213) crash test requirements. 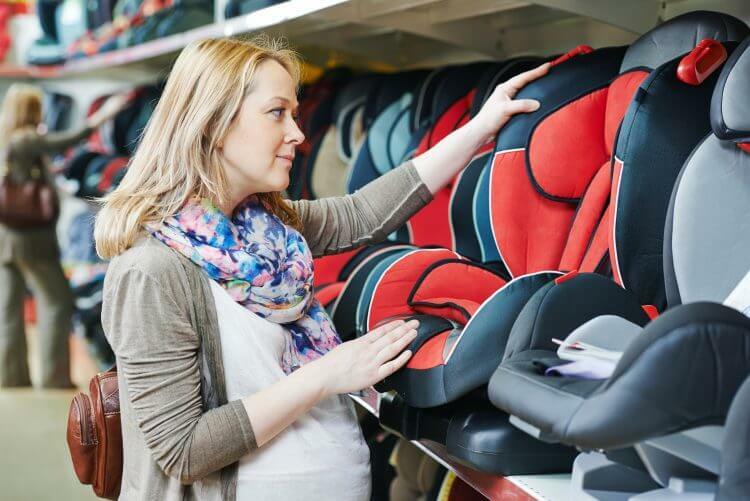 As a parent, deciding on what is the best infant car seat to purchase can be daunting. The following recommendations include top rated infant car seats, and they are some of the lightest infant car seats on the market. This is key when transporting your baby to and from the car to the house and while traveling. Ask any new parent, and they can tell you about the strain of carrying a heavy car seat. The following chart will cover the top rated baby car seats, with links to infant car seat reviews and this will help you purchase the best infant car seat for your family. Want to read more about our recommendations for lightweight and best rated infant car seats? Read below! As one of the top infant car seats on the market and also one of the lightest baby car seats, it is easy to see why the Graco Snugride SnugLock 35 is a top pick for the best baby seat. Features include energy-absorbing foam, and the LATCH install system with new arm clamping base for the perfect install.Parents will love the recline bubble indicators and excellent crash protection. Accommodates babies from 4-35lbs. 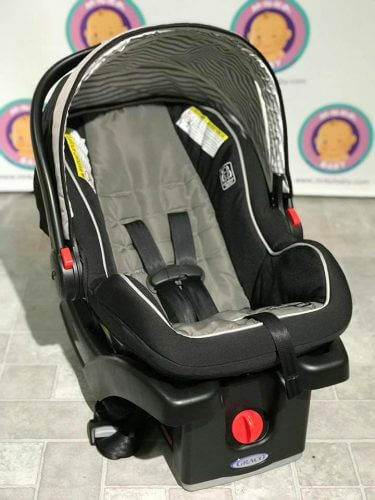 Another popular car seat on the market (rated #1 on Amazon) with premium features such as comfort padding, levelers to ensure the perfect fit, LATCH design (compatible with strollers) and newborn inserts. 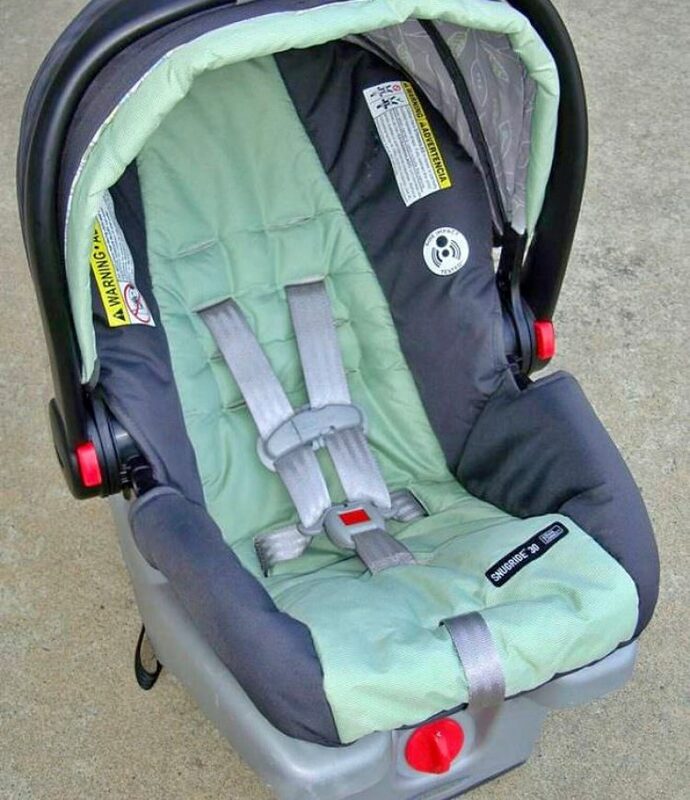 Accommodates infants from 4-30 lbs and up to 30". Britax is a well known brand for their safe products and this car seat has lots of great features and gets high marks for safety. It is the heaviest car seat (without the base) at 10 pounds, and the width of the seat is 18", making it one of the wider seats on the market. 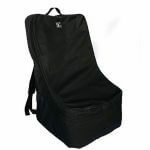 It accommodates babies from 4-35 pounds and up to 32". 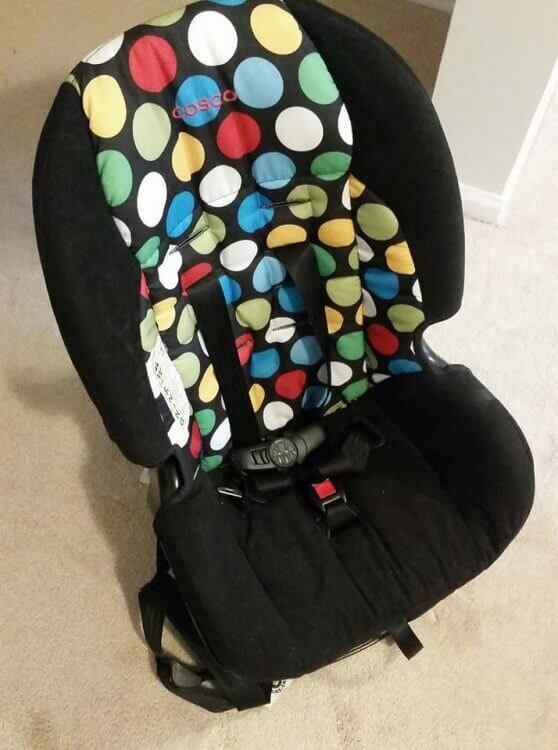 This car seat is similar to the Graco Snugride Snuglock 35, however, it is a simpler design, with vinyl style fabrics and the button to lower the handle can take a bit more pressure. 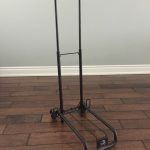 It also features a standard base without the arm clamping base and only accommodates babies up to 30 pounds. However, it is less expensive and a lighter seat at 7.5 pounds with the same top safety rating. I want a lightweight baby car seat that also gets top ratings. What is the best choice? If weight is an important choice, then the Graco Snugride 30 is a great contender. At only 7.5 pounds, it is one of the lightest car seats on the market. There is one lighter, but it is fairly expensive (Nina Pipa Lite). The Graco Snugride 30 receives top safety ratings and has a record of providing a high quality car seat to expecting parents. Why should I buy a portable baby seat? You don’t have to buy an infant car seat. 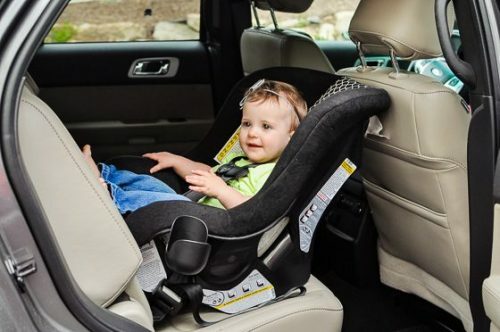 There are convertible car seats that accommodate infants, however, convertible car seats are mounted to the car, you have to take the baby in and out of the car seat each time you need to run an errand. This is the main reason that most parents choose to have an infant car seat, or bucket seat for their baby. The infant car seats have a docking base that stays in the car and you can carry just the seat. The infant car seats also can “clip” into strollers making them a portable baby seat. Can I travel with my infant car seat? Yes! All of the recommendations above are FAA approved, meaning you can take them and use them on an airplane. I recommend leaving the base and reading the instructions on how to install your car seat without the base. What is the best baby car seat? This is personal preference. 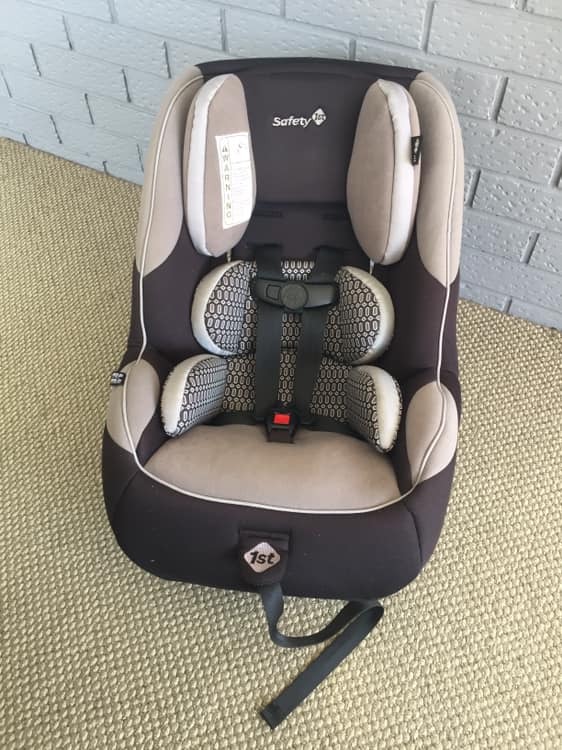 There are many factors to consider and I highly recommend going to look at car seats in person to test out the adjustments, straps and install. I’ve provided the basic information above, but all the recommendations are top safety rated, easy to use and great for babies. When children outgrow their portable infant car seat, they switch to a toddler convertible car seat. These are top rated convertible car seats that work from birth until children outgrow the use of a car seat, but often parents prefer the portable baby car seat because it can be taken in and out of the car with the locking base. Convertible car seats feature a 5 point harness, multiple adjustment points for the harness and can be installed rear facing (for children under the age of 3) and then turned around to install as a front facing car seat. They often have cup holders for toddlers and easy to adjust straps for growing children. The chart below highlights four popular models that are also some of the lightest convertible car seats on the market. 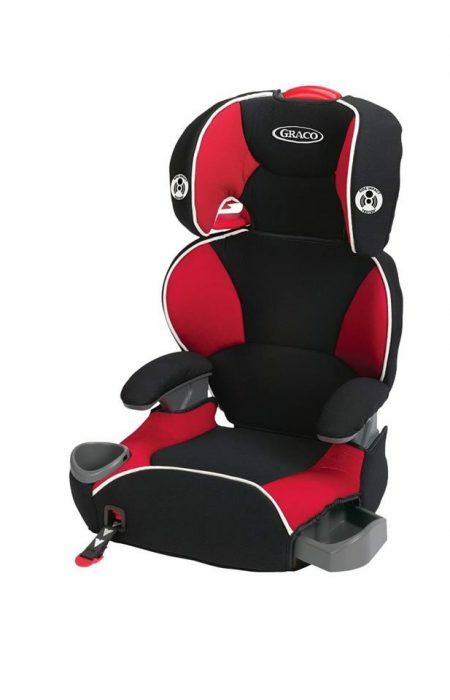 Below you’ll find the top rated toddler car seats. Fits 3 in a row! Want to read more about our recommendations for lightweight and best rated convertible car seats? Read below! We love the Cosco Scenera NEXT car seat because it simple, easy to install, slim (allowing 3 seats in one row) and has a high safety rating! It doesn't have as many bells and whistles as some other convertible car seats, but at 9.1 pounds, this is the lightest toddler car seat on the market. It can be installed either rear or forward facing and can be used with children weighing 5-40 pounds. 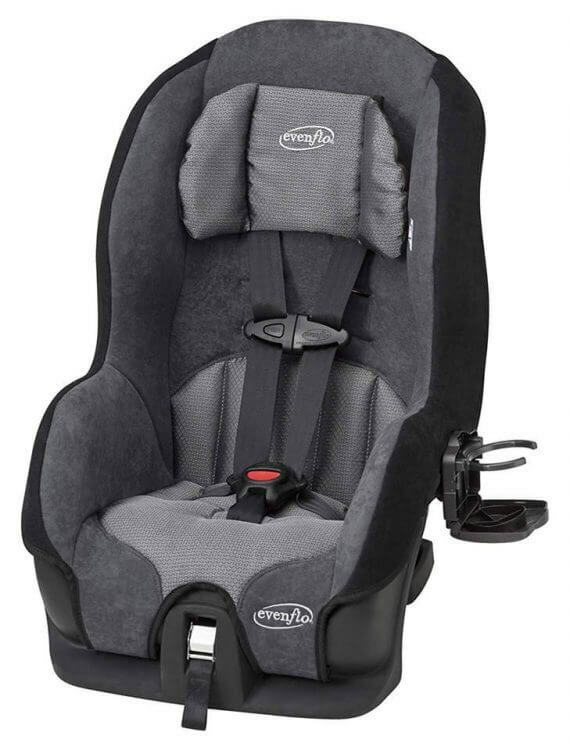 Another lightweight toddler car seat contender is the Evenflo Tribute LX. We love that it is made in the USA, has an easy to adjust harness and neck pillow for added comfort. It is also slim, allowing 3 car seats to fit in one row and it can be installed either rear or forward facing. It is rated for use for children weighting from 5-40 pounds. Safety 1st is a well known brand in the baby gear community. With it's slim Safety 1st Guide 65, you can easily fit 3 car seats in one row and it's adjustable 5 point harness keeps children safe either rear or forward facing. This compact toddler car seat is a bit heavier at 10 lbs, but it includes body pillows for a more comfortable ride. With a weight range of 5-65 lbs, this could possibly be the only car seat you'll ever need to own. This is the heaviest of the recommendations in our line up of top convertible car seats, however, it is probably the most comfortable convertible car seat with ample padding, head support and an easy to adjust harness (with no threading). This seat also has three different recline options, with a bubble indicator to make sure you have the proper positioning. It can accommodate children from 5-65 pounds. What is the lightest convertible car seat? The lightest convertible car seat is the Cosco Scenera NEXT. At 9.1 pounds, it is easy to transition between vehicles, install and fit three seat side by side. It’s lightweight, and that makes it extremely portable and easy to travel with. What is the best rated convertible car seat? 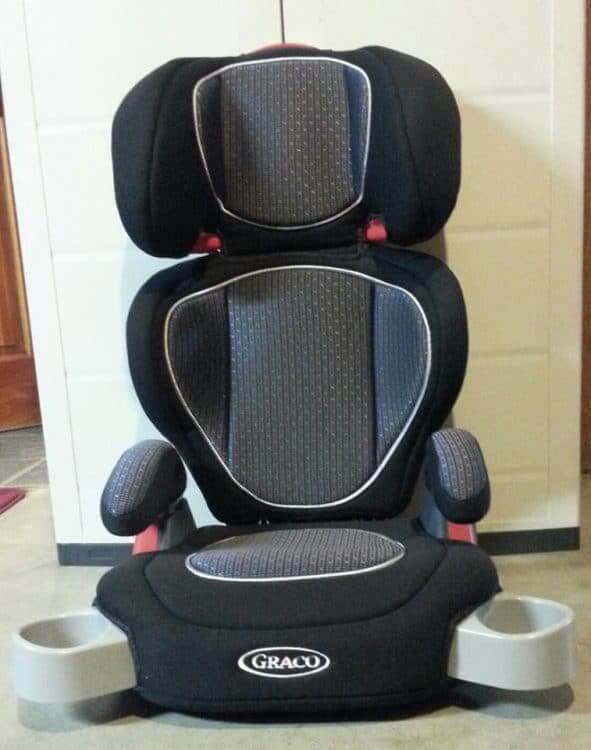 The highest rated convertible car seat is the Graco 4ever convertible booster car seat. However, it weighs over 22 pounds. If you want a combination of the best rated car seat, while still keeping weight in mind, then the Evenflo Tribute LX is the best bet. With over 3,600 positive reviews on Amazon, it is easy to see that this is a highly rated, but also lightweight convertible car seat option. What is the best convertible car seat for travel? The Cosco Scenera NEXT is our pick for travel. You can use it with children from babies up to preschoolers (up to 40lbs) and can be installed both rear and forward facing. It’s small design means that it is easy to install on an airplane with its 17″ wide base. 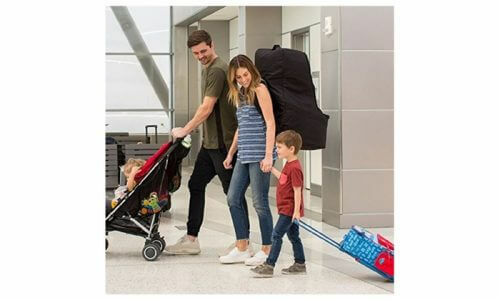 It is an extremely portable toddler car seat and can fit under larger strollers or on top of an umbrella stroller to carry it through the airport. Where can I read more toddler car seat reviews? If you want to read in-depth convertible car seat reviews about each car seat we recommend, head over to our friends at “Car Seats for the Littles“. Can I use a convertible car seat for my child from birth? Yes! Convertible car seats get their name from being convertible. Meaning you can rear face the car seat and tilt it for use with newborns and babies. Then you can adjust the tilt and harness as your child grows. Children under the age of 2 should remain in a rear facing convertible car seat, some parents prefer to keep children rear facing until the age of 3. From there, you can re-install the car seat as a forward facing convertible car seat. Two of the options above go up to 50 lbs and the other two options go up to 65 lbs, making a convertible car seat a one time purchase. However, most parents prefer to start with an infant car seat with a docking base. This allows you to take the child out of the car, while keeping the baby inside the car seat. The portability is the main reason to start with an infant car seat. Once children reach a certain height and weight limit (usually the 30 pound minimum), they can switch to a portable car booster seat. Choosing the best toddler booster seat can be a bit daunting with so many options to choose. Booster seat reviews are included to help you make the decision, and the best booster car seat is highlighted based on safety and price. 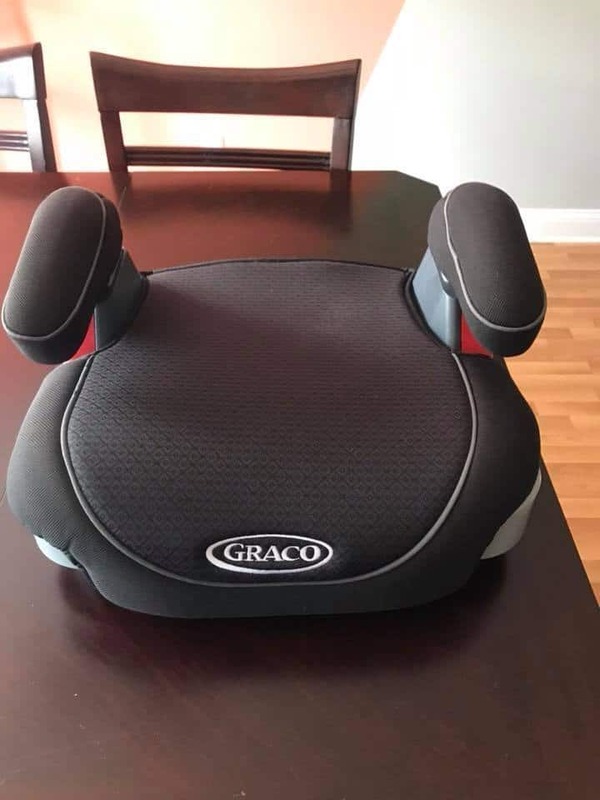 The following lightweight booster seats are great for everyday use, and you could easily use the backless booster options for travel. These boosters are recommended for children 5.5/6 years old due to the maturity needed to sit properly without the restraints of a harness. It is recommended that children stay in a five point harness for as long as the convertible car seat allows. DO NOT rush switching children to a booster seat. Check out these top rated booster seat recommendations! Want to read more about our recommendations for lightweight and best rated booster car seats? Read below! The Big AMP booster car seat is perfect for older children that are ready for a belt-positioning booster. With 6 height adjustments, you'll be able to insure the perfect fit for your child. It is able to transition to a no-back booster and fits children from 30-100 pounds, (but we recommend using a five point harness for as long as the manufacturer recommends). The Graco Highback Turbobooster is similar to the Evenflo with multiple height adjustments and padded, height-adjustable armrests. There are hide-away cup holders and it can convert to a backless booster when children meet the weight and age requirements. This booster can be used for children from 30-100 pounds, (but we recommend using a five point harness for as long as the manufacturer recommends). This is a unique "booster seat" because instead of lifting the child to conform to the height requirements of the seat belt, the child uses a vest to bring the seat belt into the proper positioning. It is more expensive that the other booster options, but it can be used at a younger age, is pack-able and has a top safety rating. The size small travel vest is meant for children that are between the ages of 3-6 years old and weigh between 30-60 pounds. Children should be 30-50" tall. There is also a size large, for children 5-10 years old, weighing 50-80 pounds and 45-57" tall. Looking for a "Grab and Go" option for older children? The Mifold Grab and Go booster is perfect for things like carpooling, taxis, traveling with older children and having an extra booster seat available for unexpected visitors. It weights an impressive 2 pounds and can fit inside a backpack or purse. It is approved only in the USA and passes all safety tests. Can I use a booster seat on an airplane? No, unfortunately booster seats are not permitted on airplanes. If your child is old enough for a booster seat, they can use a traditional airplane seat belt. What is the best travel booster car seat? Based on the ease of use, safety rating and review, the best travel booster car seat is the Ride Safer Travel Vest. It can be used from age 3 (child must be 30 pounds at minimum). When can a child use a booster seat? There is a minimum weight and age requirement (most are 30 pounds and age 4), however, there is a level of maturity needed to keep the seat belt in the proper position. We highly recommend waiting until a child is closer to 6 and practicing the proper seated position. We all know that traveling with children often requires quite a bit of gear and hauling that gear on flights, installing a car seat into a rental car and lugging it all during train travel is a hassle. Adding a light car seat for travel is a must. This section will also feature three portable car seats for travel. They are marketed for travel mostly, but also double great for carpooling, taking a friend home unexpectedly and for families that don’t own a car but need something for occasional car rides. I’ll answer your questions about what’s the best convertible car seat for travel, and what’s the best car seat to travel with. Everything from a folding car seat to a pack-able car seat and travel infant car seat. All of the recommendations are considered “travel easy” car seat options! Best of all, we own the items we recommend. Want to read more about our recommendations for lightweight toddler car seat for travel? Read below! We love the Cosco Scenera NEXT car seat because it simple, easy to install, slim (allowing 3 seats in one row) and has a high safety rating! It doesn't have as many bells and whistles as some other convertible car seats, but at 9.1 pounds, this is the lightest toddler car seat on the market. It can be installed either rear or forward facing and can be used with children weighing 5-40 pounds. It is an ideal travel car seat for babies up to toddlers. 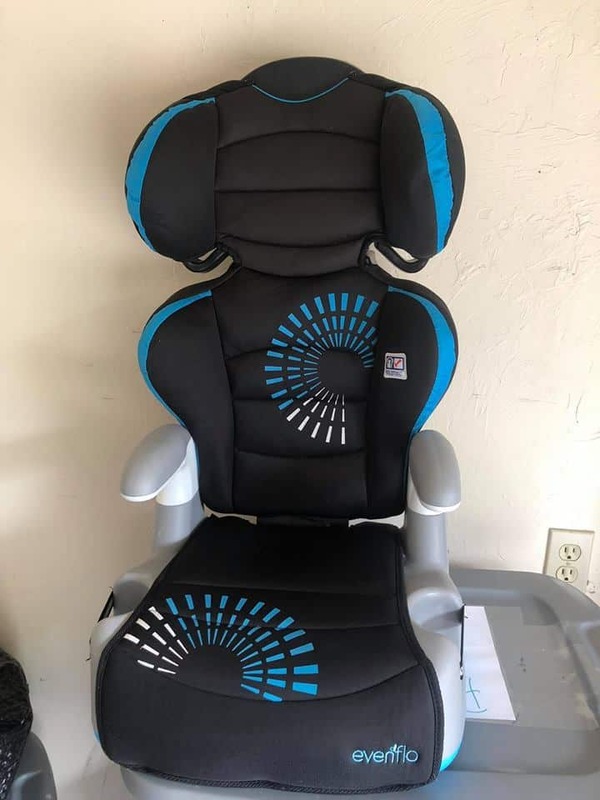 This is a unique "booster seat" because instead of lifting the child to conform to the height requirements of the seat belt, the child uses a vest to bring the seat belt into the proper positioning. It is more expensive that the other booster options, but it can be used at a younger age, is pack-able and has a top safety rating. The size small travel vest is meant for children that are between the ages of 3-6 years old and weigh between 30-60 pounds. Children should be 30-50" tall. There is also a size large, for children 5-10 years old, weighing 50-80 pounds and 45-57" tall. This is our recommended travel seat for children ages 3 and up. Is there really such thing as a fold-able car seat? Yes! I’m so thankful that we found the Ride Safer Travel Vest when my son was young, it was a serious lifesaver! It is a vest that the child wears inside the car, and the seat belt runs through the attachments to provide the proper seating position and belt positioning. Best of all, you can toss it right into your luggage, and it doesn’t take up any more space than a coat. There are so many uses for it other than travel such as carpooling, fitting three kids in the backseat of a small SUV and for extra friends that need an unexpected ride home. What’s the BEST toddler car seat for travel? If your child is 3 and under, I highly recommend the Cosco Scenera Next. You can’t beat its lightweight simple design, it is easy to install and easy to transport. With high safety ratings, it’s a top pick from many traveling families. I need a lightweight convertible car seat for travel, what are my options? Depending on the age of your child, you have a few options. We always recommend purchasing a separate car seat for travel and looking for one that is both light, easy to install and has top safety ratings. The three recommendations above fit those specifications. Are there any good compact car seat for travel options? I need to fit three car seats in a rental car. For families with more than two children, finding a rental car to fit everyone can be a hassle. Luckily the three recommendations above can all fit “3 to a row”. They are all slim fitting and can fit inside a small SUV. I can attest to the fact that I can fit three in the back of my Subaru Crosstrek. You can also do a combination of seats for children of various ages. We’ve had two Cosco Scenera’s with a rider safer harness travel vest in the middle. 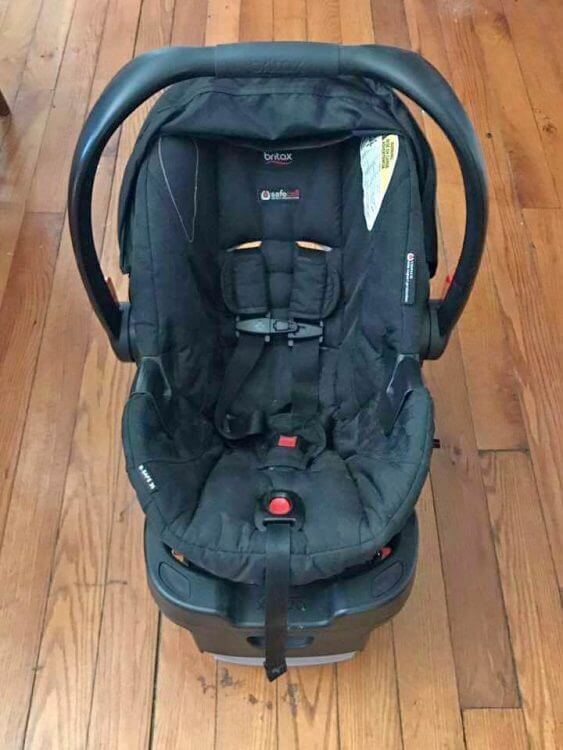 What is my option for a travel baby car seat? You can take your baby’s infant car seat, but if you plan on traveling often, I’d go ahead and invest in the Cosco Scenera because it will grow with your child. I also recommend having a dedicated travel car seat because let’s be honest, travel can be tough on gear. If you choose to check your car seat, it could be damaged. First of all, the safest place for a child on the airplane is in a FAA approved car seat in their own seat. Yes, I know that children under the age of 2 aren’t required to have their own seat and yes, we’ve flown with our son as a lap child. I’m just letting you know what the FAA recommends. 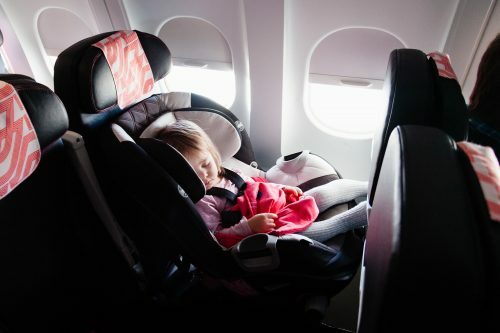 So what’s the best car seat for airplane travel? First of all, it has to be FAA approved. All of my recommendations for the best car seats for air travel have this sticker. If you are going to do some air travel with a car seat, be sure to check the side of the car seat to see if there is an FAA approved sticker. I’ll also cover everything you need to know for how to install car seats for traveling on a plane, what to expect when flying with a car seat and what accessories to bring to make transporting the car seat easier inside the airport. Want to read more about our recommendations for the best car seat for the airplane? Read below! 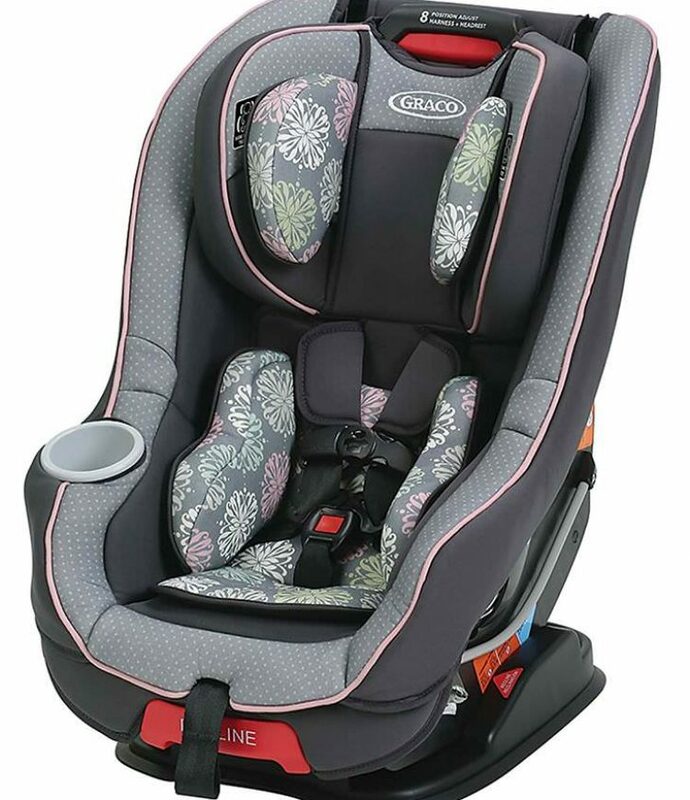 Chicco Keyfit 30 is a popular car seat on the market (rated #1 on Amazon) with premium features such as comfort padding, levelers to ensure the perfect fit, LATCH design (compatible with strollers) and newborn inserts. Accommodates infants from 4-30 lbs and up to 30". It is FAA approved and at 17" wide, it will fit in airplane seats. The Cosco Scenera NEXT car seat is simple, easy to install, slim (allowing 3 seats in one row) and has a high safety rating! It doesn't have as many bells and whistles as some other convertible car seats, but at 9.1 pounds, this is the lightest toddler car seat on the market. It can be installed either rear or forward facing and can be used with children weighing 5-40 pounds. It is an ideal toddler car seat to use on an airplane with it's 17" wide base and it is FAA approved. 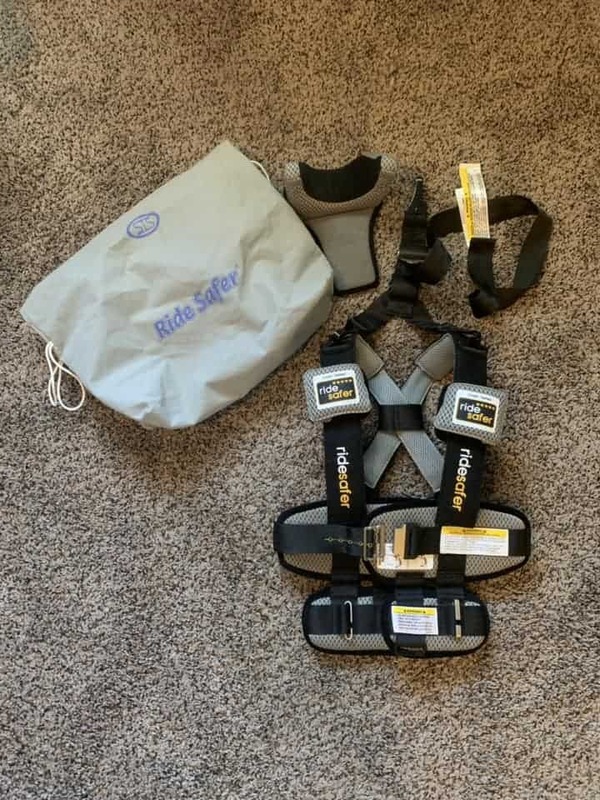 Safety 1st is a well known brand in the baby gear community. With it's slim Safety 1st Guide 65, you can easily fit 3 car seats in one row and it's adjustable 5 point harness keeps children safe either rear or forward facing. This compact toddler car seat is a bit heavier at 10 lbs, but it includes body pillows for a more comfortable ride. With a weight range of 5-65 lbs, this could possibly be the only car seat you'll ever need to own. It's base is a bit wider at 18.5", but most airlines should be able to accommodate this seat. It is FAA approved. 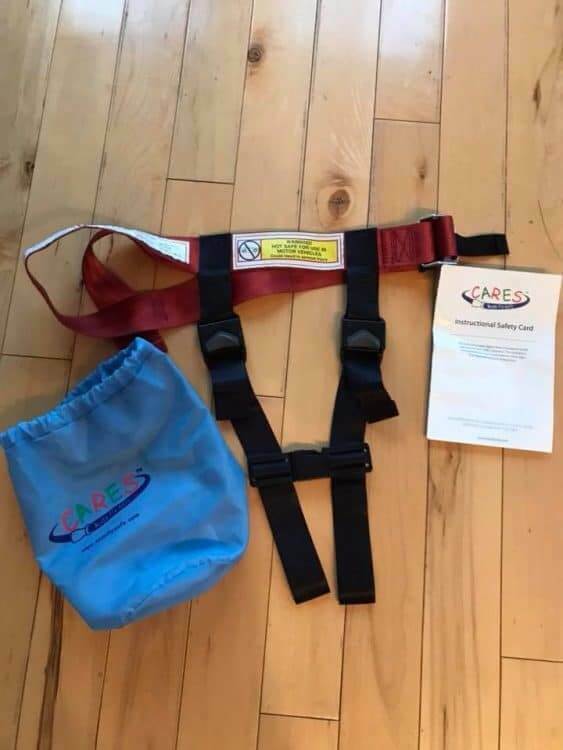 If you want a child restraint on the airplane, but don't require a car seat at your destination, then the Cares Kids Fly Safe Safety Harness is the perfect option. It is easy to install and packs into a backpack or carry-on weighing just one pound. It is FAA approved and is only able to be used on an airplane (not in a car), but it will provide the same safety as a car seat without the hassle. What does an FAA approved car seat mean? A car seat or “child restraint system” is a hard-backed child safety seat that is approved by the government for use in both motor vehicles and aircraft. FAA controls the approval of some but not all child restraint systems. The sticker on the car seat must say: “This restraint is certified for use in motor vehicles and aircraft.” If not, you may be asked to “gate check” your car seat, and you will not be able to use it on the airplane. What is the best car seat for flying? This comes down to your preference. 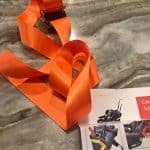 If you only need a car seat for on the airplane, but not for transportation after the flight, then I recommend the CARES Harness. It is the only FAA approved device. It is also the best “car seat” for airplane travel with a toddler as long as they weigh between 22 and 44 pounds. 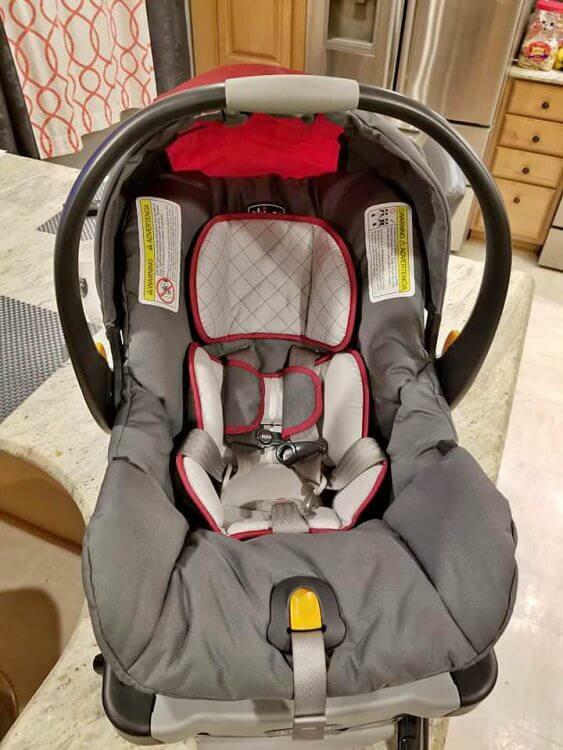 If you DO require a car seat for BOTH airplane and transportation, I recommend the Cosco Scenera NEXT because it is only 17″ in width (fitting easily in tight airplane seats), it is lightweight at just 9.1 pounds, and it is incredibly affordable. It is an excellent option for both travels with an infant as well as a toddler. Why can’t I just use a baby airplane seat or baby bassinet? It’s tricky with babies because according to the airlines, they can travel free (on a parents lap) up until the age of 2. Longer flights also give the option for a baby bassinet that you can reserve. However, none of these options are safe as an FAA approved car seat (which often requires purchasing an extra seat). However, if the flight is not full, you can request to use an extra seat to accommodate your baby in an approved FAA approved airplane car seat. Just ask the boarding gate agent if they can accommodate you. There is no extra cost if you choose this option. Can I board early to install my car seat on the plane? Yes, airlines vary slightly, but the majority allow children (under a certain age (usually 2)) to board early. Even if your child is older, but still requires a car seat, just walk up and ask the boarding gate agent and tell them that you need a bit of extra time. What is it like flying with a toddler car seat? It requires a bit of extra gear. You need to decide how you will get the car seat through the airport. Popular options are car seat trolleys, using strollers and straps to attach them to existing luggage. The car seat will need to go through security and then you’ll need to board early to install your car seat properly. Watch the video below to help you be prepared for the install. 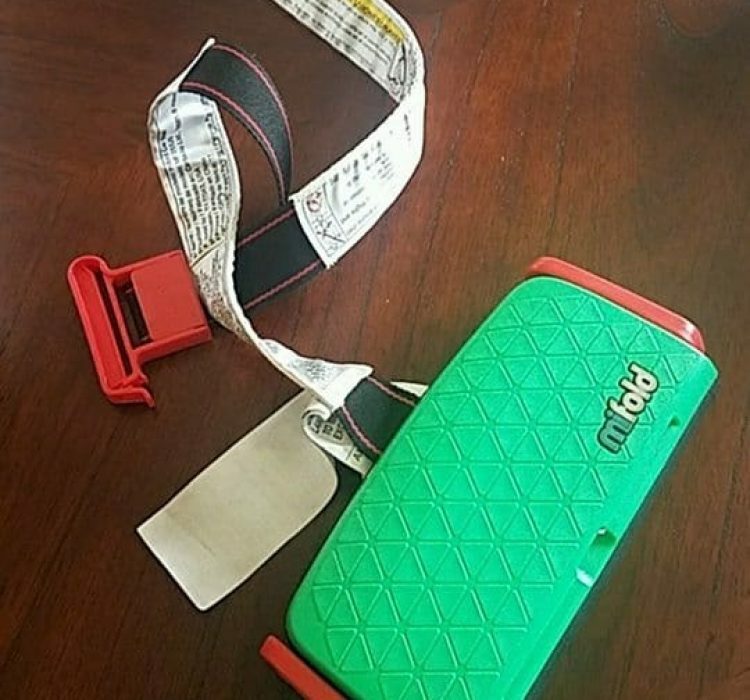 *Note: flip the buckle 180 degrees before you thread it through the car seat back to have the clip face towards the back of the airplane seat (not the child seat) to prevent being unable to open the clip. Watch this video so you understand how to install a car seat on an airplane. 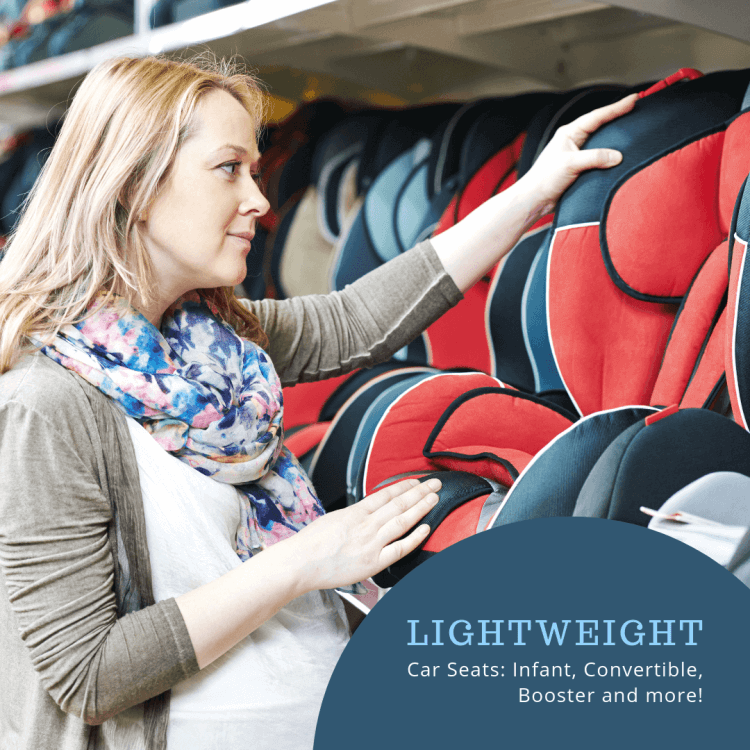 We’ve covered a variety of lightweight car seats in various styles, but if you decide to bring your car seat onto the airplane or decide to “baggage check” the car seat, you’ll need some extra gear. The Britax Car Seat Travel Cart is perfect for hauling your car seat through the airport. It is NOT just for Britax car seats, but does work best for car seats with LATCH attachments (there isn't a strap to put around the car seat). This will allow you to easily pull the car seat through security. Then the travel cart packs flat and can be stored during the flight while you install the car seat onto the airplane seat. A great option and I've seen parents also use the cart with car seat as a "stroller" in the airport (although the product does not recommend this). This is the simplest option for transporting a car seat through the airport, but it requires the use of a roller carry-on luggage. You'll strap the car seat to the rolling luggage with this strap. It includes a unique hook to keep the car seat from slipping down. Like this article? Want to save it for future reference? Use these Pinterest images to save this article. I hope you found this post helpful. Which car seat did you pick? Share it below in the comments, I would love to connect with you! Are ready to book your next trip and you just need a bit of inspiration? Head over to our Destinations page to explore our interactive map of the world.